Ok…this concept from Matt Chandler blew my mind. The first time I read it I thought “nice quote.” Then, after reading it through a couple of times and allowing it to penetrate through the cliche part of my brain to something deeper I began to really get on board with what Matt Chandler is saying. Let’s call this the head to heart transition. Take a few moments and reread these words today. Allow their meaning to seep into your soul. When we are suffering what is the first thing we look for? Relief, an escape, a way to stop or avoid the pain. That is our human nature. We need to take a fresh look at Jesus in times of suffering, to understand better the promises He makes us when we find ourselves in the valley. 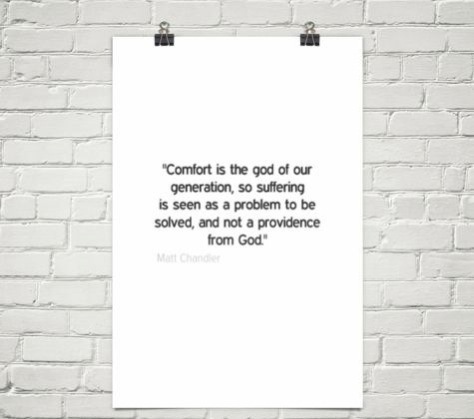 Let me encourage you that in our suffering, God wants to be our comfort. Unfortunately, the guarantee for a pain free life comes only as a fairytale so on the bad days, know that God has not left you. He has not forsaken you. I encourage you to look again at Jesus with the words from Laura Story’s song, Blessings.